Karl Rosenfield Peony | Gurney's Seed & Nursery Co. 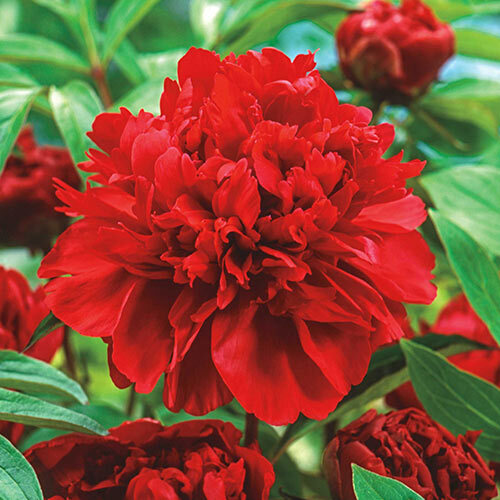 This classic herbaceous peony adds fragrance and brilliant, fuchsia-red color to the late spring garden. Its showy, double flowers look outstanding in cut-flower arrangements, while its glossy green foliage remains attractive throughout the growing season. Growing 30-36 inches tall with a similar spread, this long-lived perennial makes an excellent specimen plant in the perennial flower bed—or plant several to create a small hedge along fences, sidewalks or driveways. Karl Rosenfield Peony grows best when planted in full sun to partial shade. Attracts butterflies. Deer and rabbits tend to avoid. Zones 3-8. LightFlowers best when planted in full sun; prefers light shade in Southern regions. FoliageGlossy, deep green foliage that is very attractive and ornamental throughout the growing season. The new growth in Spring is burgundy colored and turns a soft yellow in the Fall. Flower FormLarge double blooms with frothy petals. Soil RequirementsWell-drained, humus enriched, moisture retentive, slightly acidic soil. Growth RateSlow the first 1 - 2 years. Thereafter growth is moderate when left undisturbed. PruningOnly prune to remove spent flower stems after blooming. Cut to the ground after foliage dies in late fall. CommentsFlowers have a very soft and fluffy appearance and they are carried on strong, weather resistant stems. A heavy bloomer with beautiful foliage that is attractive throughout the growing season, making it an ideal companion for other perennials. Extremely hardy and care-free. DepthIt is very important to plant with the eyes 2 inches below the soil level. If they are planted too deeply, poor flowering will result.